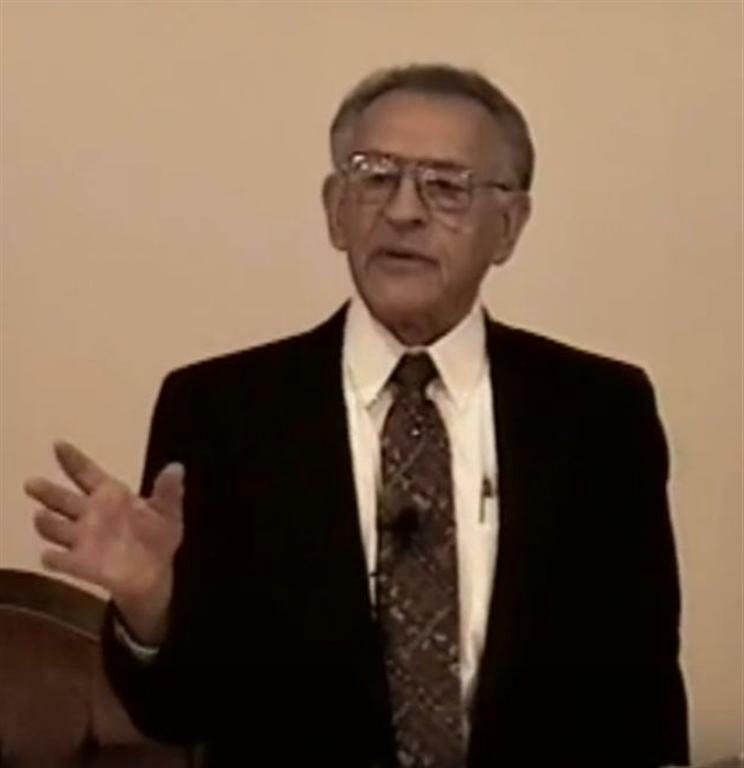 ﻿﻿Lee Vayle (September 28, 1914 - June 22, 2012) was a Christian minister who was a long-time personal friend and associate  of William Branham and his worldwide ministry. Lee Vayle first attended the Branham campaign in 1947 in Canada. He later met William Branham in August 1953. He discussed the development and nature of their friendship and association in the sermon entitled Testimony: Reminiscing 1986-0413 Edmonton, Alberta Canada. Lee Vayle recounted what William Branham told him when they first met in August 1953. "Bro. Branham said, "Bro. Vayle, I saw you coming, there's a flame of fire over your head, it's the spirit of prophecy." There were different meetings in which Lee Vayle served as the manager and also ministered in the afternoon service in the Branham campaigns. William Branham on occasion referred to him in these capacities. Lee Vayle’s message teaching ministry in relation with William Branham’s message (pre and post Branham’s death) span well over 50 years, and decades worth of his recorded teaching sermons are available and accessible online. He traveled extensively throughout the US and Canada as well as abroad for many years ministering, as is evidenced by his sermon catalog. His home base and church was St. Paris, OH and Grace Gospel Church. He was identified by William Branham as the brother for any minister or laity to go to with any question they might have concerning his (William Branham's) doctrine. Lee Vayle wrote Twentieth Century Prophet which William Branham believed would be a grand masterpiece and the greatest asset for his ministry since the inception of his public campaigns. He also grammarized William Branham’s book, The Exposition of the Seven Church Ages. The book was based on the sermon series of the seven church ages that Bro. Branham preaching in 1960. This project required an extensive amount of time and research. Bro. Vayle was in on-going communication with Bro. Branham concerning the making of this book. Other doctrinal teachings were integrated and this books stands as the ministry's greatest doctrinal thesis ever published of which William Branham was very well pleased. Many things William Branham himself said bears witness to the unique relationship that existed between him and Lee Vayle. William Branham made statements that affirm the thought of a “Moses and Aaron” type in the last days.” “Just like we had a real Moses and a real Aaron, then we had a Jambres and Jannes after them.”  "there's to be a Jannes and Jambres rise up in the last days to withstand Moses and Aaron"
William Branham acknowledged the different nature of their callings and the necessity of Lee Vayle’s ministry, calling Lee Vayle a profound teacher. "Brother Vayle is quite a profound teacher, and really a good education. I don't have enough education to break it down. But somehow or another, the Lord helps me to get by." "I wouldn't try to take Brother Vayle's place or your place. It'd be just as hard for me to take his place, probably, as for him to take my place. So we just abide in our calling." This type has scriptural precedent as in Exodus 4:14-16, Moses contended with God concerning his inability to communicate and the Lord's response was to give him Aaron to assist him. KJV(i) 14 And the anger of the LORD was kindled against Moses, and he said, Is not Aaron the Levite thy brother? I know that he can speak well. And also, behold, he cometh forth to meet thee: and when he seeth thee, he will be glad in his heart. 15 And thou shalt speak unto him, and put words in his mouth: and I will be with thy mouth, and with his mouth, and will teach you what ye shall do. 16 And he shall be thy spokesman unto the people: and he shall be, even he shall be to thee instead of a mouth, and thou shalt be to him instead of God. A notable point is that "Aaron" in fact means "teacher". William Branham also placed Lee Vayle’s word under the sign of vindication the same as his own. Those familiar with Branham’s ministry understand this to be the last sign of vindication - the sign of the Messiah. "God had chosen Moses and God had chosen Aaron, and it was the message of the day." "A true prophet of God, a true teacher is trying to bring the church to a unity of spirit, that they might recognize God." The central teaching of Lee Vayle was delineating William Branham's doctrine concerning the Father and Son as well as that of the Presence (parousia) Appearing of the God and Father of our Lord Jesus Christ. This teaching is based upon revelation of the Scripture and is the essence of William Branham's message. It expounds on the reality of the LORD himself (God the Father) come down (to earth) with a shout (the message), voice and trump, to bring a revelation, resurrection and a rapture (Rev. 10:1, 1 Thess. 4:16, Ephesians 1:17-23). His appearing has to do with the fulfilling of Psalms 110:1 "The LORD said unto my Lord, Sit thou at my right hand, until I make thine enemies thy footstool," which concludes with all of Christ's enemies being made subject (1 Cor. 15:24-28). This descended, personal presence appearing of Jehovah (the LORD himself) precedes the bride's meeting of the Lord Jesus Christ (the son of God) in the air. The season of his appearing is necessary to bring the bride into order (or subjection) and into a condition to be changed and subsequently meet the Lord in the air. He made his first public appearance on the Ohio river in 1933 while William Branham was baptizing a convert to Christ. This presence was identified throughout the life and ministry of William Branham by the discerning of the thoughts and the intents of the heart. It is the appearing of Christ before the coming of Christ, and will lead the bride into the millennium. See the Presence and Rapture series for more information. There is no other minister associated with William Branham's ministry more acknowledged than Lee Vayle. There are believers throughout the world that subscribe to the authority of the message teaching of Lee Vayle in connection with William Branham’s message. It’s not often that a man makes such a mark on history. We look back in the Bible and think, “Where would we be if God had not anointed such scribes as Seraiah, Shaphan, and Ezra?” These are the men who preserved the Word of God into print, and their work laid a foundation for what we have today. Recently, one of these great men went to be with the Lord. Brother Lee Vayle, the man who worked closely with the prophet to preserve the Seven Church Ages into written format, made a mark on history that will never be forgotten. By yielding his talents and experience to the anointing of the Word, the Lord used his hands to take Brother Branham’s words and produce a book that shows the undeniable Truth of the Message of Malachi 4. God then used An Exposition Of The Seven Church Ages to turn the hearts of hundreds of thousands of people back to the Gospel of Jesus Christ. With only a handful of men throughout history who have made such a mark, his life of service would have been complete when the last word was written in the Church Age book, but Brother Vayle continued his service to the Bride of Christ for decades as a pastor and minister of the Gospel.